FORUS HEALTH HAS DEVELOPED ADVANCED TECHNOLOGY THAT CAN BE USED WITH MINIMAL TRAINING ALLOWING FOR DEPLOYMENT IN RURAL AREAS. Forus Health eradicates preventable blindness by increasing access and affordability of eye screening using advanced technology. 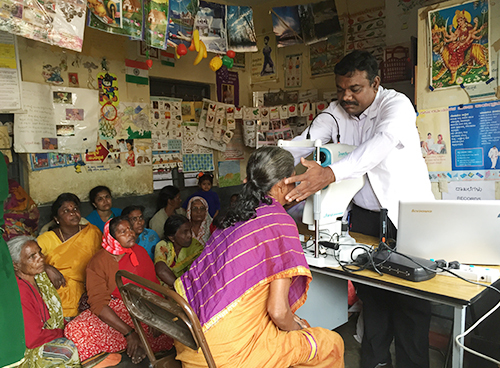 Forus Health has developed their own product line of eye screening devices which are considerably cheaper than existing technology, increasing affordability. The devices are also portable, compact and can be operated by a minimally trained technician, allowing deployment in remote areas. The first product, called 3Nethra, can pre-screen five ophthalmic diseases in just 5 minutes, which collectively contribute to nearly 90% of blindness in India. The Forus team takes care of all steps in the process, including Research and Development, manufacturing, installation and sales abroad. Delivery of healthcare is a serious challenge in India. Low doctor-to-patient ratio, illiteracy and poor infrastructure constrain public service delivery. According to Forus Health, 15 million of the world’s 40 million blind people live in India, which is mainly due to limited access to eye care facilities, high cost of treatment and lack of awareness. An even higher number of people are visually impaired. 80% of cases are avoidable. Forus Health’s business model revolutionizes healthcare delivery by leveraging cloud storage, tele medicine and data center facilities to democratize screenings. Imaging centers, run by the Government or entrepreneurs, purchase packages of eye screenings on a subscription basis that they offer to end-users, charging a patient fee per report. The cloud run telemedicine platform facilitates remote diagnosis by reviewers (ophthalmologists), who also receive a fee per report. This low-cost solution thus addresses the constraints posed by infrastructure and limited qualified professionals through technology and online solutions. Founded in 2010, Bangalore based Forus Health today employs 120 people. In 2012-2013, they raised USD 13 million from Asian Healthcare Fund and the venture capital funds Accel Partners and IDG Ventures. Starting with a product idea, they have now developed five products, the latest being a device preventing blindness in prematurely-born babies. The company has sold over 1,400 products in 26 countries, performing more than 2 million eye screenings around the world. They are beginning to launch a few products on the global market. The remaining products are undergoing regulatory certification and are to date only available in India. The subscription based business model is only implemented in India.